On June 4 I received an email from one of my Breeding Bird Atlasers, Kathy Foley, saying that her husband, Michael Fager, had discovered a small colony of Common Terns nesting under the Route 99 bridge between Everett and Charlestown. I was absolutely thrilled, so on June 8 I went with my camera to check it out. 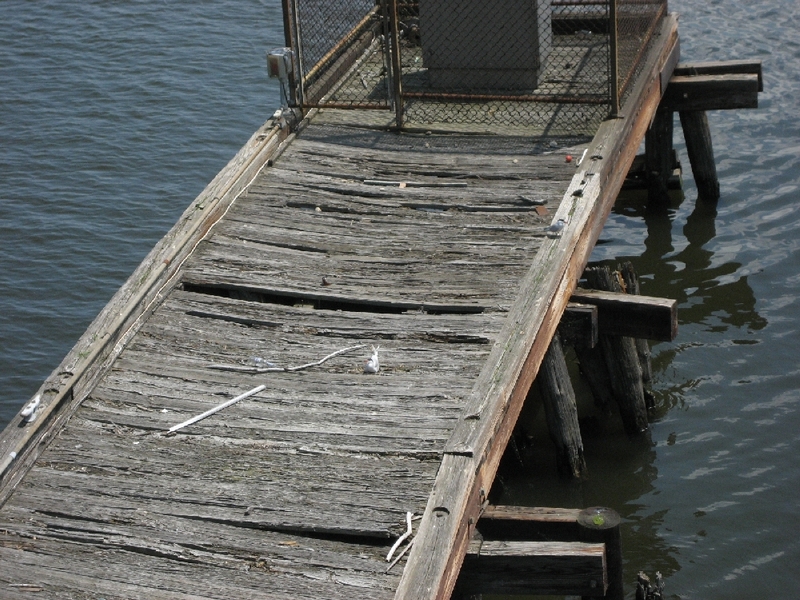 When I got there I saw a small pier running out from the bridge, and I could see terns perching on it. June 8, Route 99: I counted eight birds on nests. The other terns were lounging around - I saw no signs of fishing apart from short forays away and back. June 8, Route 99: It was 90 degrees, and the incubating birds didn't look very pleased. I was interested to note that one egg had escaped a nest (between the two nests). On June 8 Kathy and Michael were out atlasing and discovered another tern nesting on the Mystic River, this time on the Route 28 bridge between Medford and Somerville, a first Middlesex County record as far as I can tell. On June 10, Route 28: I went to check it out and found a single tern incubating. I went down the Mystic River to see what was happening with the terns. June 26, Route 28: I was tickled to see a food delivery while I was there. June 26, Route 99: All sorts of stuff going on here - two chicks, two rejected eggs, and on the right a tern apparently incubating. In the photo of the pier taken on June 8 there is no evidence of a tern nesting in this location. June 26, Route 99: While I was there, the mate came in with a food delivery. I tried changing angles to see if I could see any eggs while she was standing, but I couldn't see. June 26, Route 99: There were a fair number of rejected eggs. On June 8 there was a single "reject" egg, but nothing like this number. July 6, Route 99: A shot of the Route 99 pier shows several terns still apparently incubating. July 6, Route 99: There were five groups of hatched young of various sizes, three with two chicks, two with one chick. Could have missed some. Although there are several feeding trips, there were probably not more than a dozen during the 30 minutes I watched them. July 6, Route 28: At Route 28 I initially saw no chick, but when I saw a tern flying under the pier I realized there was a single chick on a broken beam. July 6, Route 28: I was impressed with the parent who came in with food at least four times during the time I was there, but it seemed like such a vulnerable position I wasn't optimistic about the future of this chick. July 13, Route 99: I counted six broods, including some chicks that were well developed and beginning to show the black cap. There appeared to be three adult terns still on nest. I wasn't able to spend a whole lot of time there because someone saw me with my camera and I was threatened with arrest (there's an LNG terminal nearby and they think it's a terrorist target). July 13, Route 28: Two chicks! I have no idea how I could have missed one last week, especially since I watched the adult deliver food four consecutive times to the single chick. July 13, Route 28: Occasionally they would leave their perch for a short swim. I thought that was odd so I asked tern experts Ian Nisbet and Hector Galbraith about this behavior, and both said they had only seen this happen if there were some sort of threat. These chicks seemed to take to the water randomly - no obvious threat nearby, no association with parent's food delivery (or non-delivery). Route 28: Speaking of threats, on the Route 99 bridge where there were nine or ten pairs of terns, I never observed any aggressive behavior toward gulls, but at the Route 28 bridge the single pair were extremely aggressive toward gulls. If a gull showed up even at a distance, one of the adults would fly off toward it vocalizing loudly and strafing the interloper. Route 28, July 19: When I first arrived I looked for the chicks under the pier again, but couldn't find them. But as I approached the pier one of the adults came right at me. That's promising! Route 28, July 19: There they were, back on the pier again. Route 28, July 19: And they can fly! Route 28, July 19: On closer examination it seems to be just a stick. Practice. Route 28, July 19: And eventually came back to the pier. Nature doesn't always have happy endings. A single pair of terns nesting on a pier sounded unpromising, then the chicks fell off the pier. I was sure that these chicks were not going to make it. Does a single pair of Common Terns really matter in the overall scheme of things? Probably not, but it is a pleasure seeing these guys beat the odds.